For the first time in a career spanned over thirty years, Ziggy Marley has released a self-titled album. 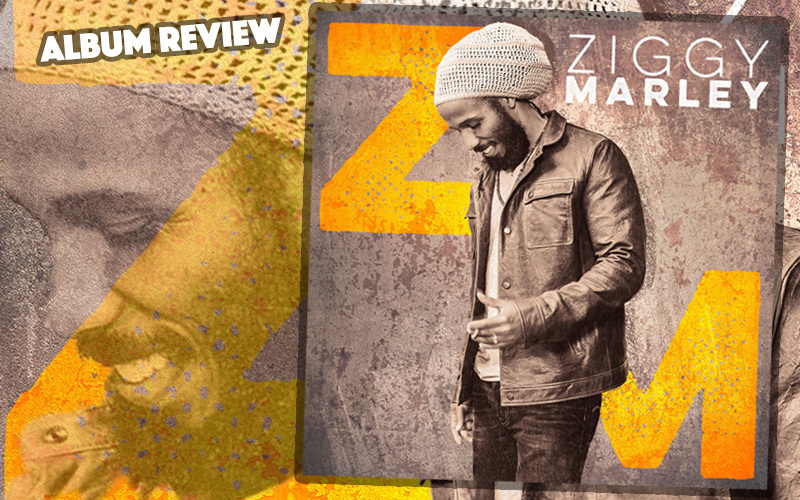 Ziggy Marley, the sixth entry of his solo career, is a slight turn from the reggae superstar's more recent output, yet feels of a piece with the eclectic intentions he's established as standard practice on his previous two records. It's been ten years since Love is My Religion returned Marley to his one-drop roots, with a collection of songs that lived mostly in roots reggae and its brethren. Since that hit, Ziggy's approach, both musically and lyrically has diversified. While embracing genres like alternative rock and pop balladry, he turned his expressions inward on much of both Wild and Free and 2013's Grammy-winning Fly Rasta. With this eponymous album, Marley alters course a few clicks, addressing more directly and intently than ever before the world around him. He's always kept a keen eye on the injustices and inequities in his purview, citing environmental issues from his solo debut, Dragonfly, on up. Here, he is active and engaged early and often. The set opens with Start it Up, and a call for revolution. Its more a benign request than radical, with Ziggy encouraging participation and contribution rather than aggression. Marley is, above all, a believer in love. Weekends Long rides the duality of earthly pursuits and celestial reward, and features an on-the-nose use of pan drum that evokes toes in the Caribbean sand and heads in the clouds. Next is the upbeat inflection of Ceceil, whose lyrics recall the blues, but whose rhythm hybridizes new wave punch with echoes of ska. Marley, who produced the album, empowers his guests admirably, dropping The Regiment horn section into Amen to wonderful effect. The brash brass lines drive a vocal crisping at the edges, close to burnt, as Marley takes oratorical aim at the aggressors. Brother Stephen 'Ragga' Marley lends his voice to the albums most heartfelt and condemning offering, Heaven Can't Take It, that unfolds into an homage to Bob Marley's Zion Train. The album's second half shifts from the overtones of lamentation and spirituality in the first, to a chorus of love and the role it can play in the healing. If the album begins with his questions and concerns, it concludes with Marley's answers. Better Together reads like a traditional offering of reconciliation until the scope widens, with Ziggy hinting not at a couple staying together, but a world coming together. Butterflies, perhaps the finest cut of the dozen, showcases all that makes Marley exceptional: A foreboding bassline and snapping horns on a minor-key bedrock, supporting a metaphor that not only imagines but realizes peace as it flutters. Marley dips back into swivel-hips '60s pop for We Are More, before the charging Love Is A Rebel recaptures the roots rock. As though a companion theme to his graphic novel, Marijuanaman smiles and swings, but makes clear the potential good that can come from a world more tolerant and accepting of a versatile and vindicated herb. Closing out the string is We Are The People, as Ziggy's reminds his audience of its power to create change, before I'm Not Made Of Stone, and its confessional humility signal the end. This is an appropriately self-tilted effort. It is an on-the-record accumulation of intrepid and unfiltered thoughts and opinions, advice and concerns, optimism and urgency, life and love. This is Ziggy Marley.